But, I did need a medal hanger. Yip I needed one! 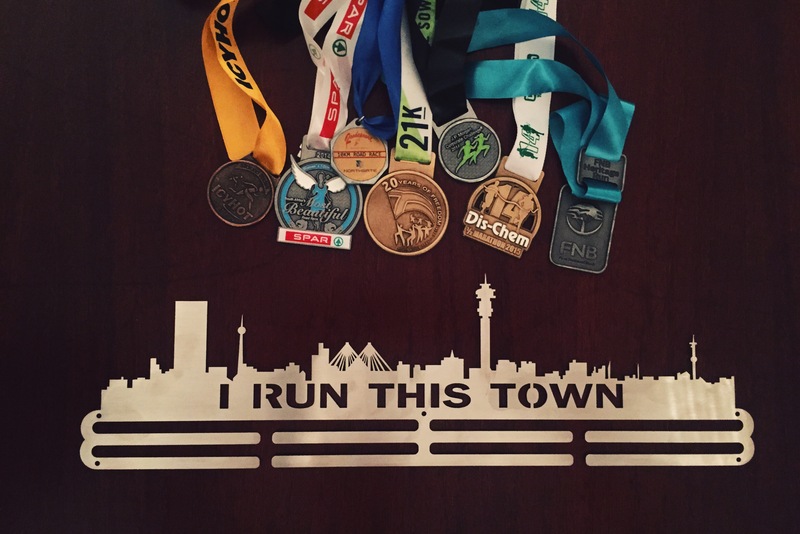 I’ve been following Pamela’s Medal Hanger business since she started it (as a fellow blogger), and I’ve been eyeing out her running designs since I started collecting race medals. I got a 45cm hanger with a double strip. She also sells the hangers in 65cm with single, double or even triple rows. She also has medal hangers for all sorts of sports, and can design just about anything you’d like on the hanger. I’ve seen lots of hanger designs for running, cycling, trail running, triathlons, dancing, martial arts… and she’s even worked out a rosette hanger for horse riding. Go to the SA Medal Hangers Facebook page and have a look at the photos of the different designs… and then email her and order. It takes 2 weeks to deliver. If you don’t want to order online, Pamela does go to some of the bigger races, like the big triathlons, and I know she’ll be at the Two Oceans expo, so you’ll be able to buy one there too. They’re such great gifts for sports people… and for school kids! Disclaimer: I was not asked to blog about this, I just like the product. Definitely going to have to get me one of these! Oops! Mistyped my blog URL in my last comment submission!